Fabrications, hoaxes and other lies about the horrific mass shooting in Las Vegas this week which killed at least 59 people and wounded well over 500 others have been spreading rampant on YouTube, and it’s unclear if the video giant has any plans to do anything about it. When Gizmodo entered the same query, a video titled “Las Vegas Shooting Narrative Debunked In 3 Videos” floated directly to the top of results below the “Top news” section. YouTube’s suggested queries brought up videos from far-right personalities including conspiracy theorists Alex Jones and Stefan Molyneux, those suggesting post-shooting interviews were conducted in front of a green screen and others asserting the entire attack was a false flag. Many of the videos disputed mass shooter Stephen Paddock carried out the attack alone or alleged it was part of a conspiracy to bring about a change in gun control laws. 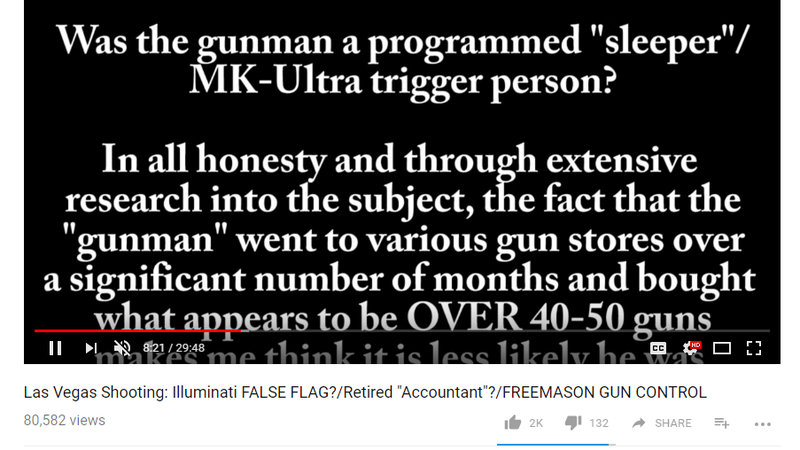 After the Guardian watched one questionable video highlighted on the main Las Vegas shooting search page (from a gun rights advocate suggesting the facts didn’t add up), YouTube promoted: “Government Staged Las Vegas Mass Shooting” (215,000 views), “PROOF: MEDIA & LAW ENFORCEMENT ARE LYING ABOUT THE VEGAS SHOOTING” (660,000 views) and “PROOF Las Vegas shooting FALSE FLAG hoax” (70,000 views). The site automatically played a “Las Vegas HOAX Exposed” video (150,000 views). Google, YouTube’s parent company, has also been driving users to sites deliberately promoting misinformation and conspiratorial ramblings about the attacks in recent days. Google later told Gizmodo that “within hours, the 4chan story was algorithmically replaced by relevant results,” adding its algorithm generated the links by weighing both “authoritativeness” and whether or not they were “fresh”—essentially an appeal to a faceless algorithm. Similarly fake stories spread wild on social media sites like Facebook as well, with Facebook offering similar explanations. Google did not respond to a request for comment on this story. We’ll update if we hear back.